In the opening shots of Hirokazu Kore-eda's debut feature film, “Maborosi” (1995), young Yumiko chases after her grandmother, who is glimpsed only from behind and at a great distance, as a figure retreating first down a tunnel and later alongside a bridge. Little Yumiko begs her adored grandmother to come back, but the old woman states flatly that she wishes to her childhood home in Shikoku to die. Which she does. Innocuous in content, but perfectly rhymed with the opening images, this shot strikes like a bolt from a clear sky. There is little doubt that it announces another tragedy about to disrupt Yumiko's life. There is even less doubt it is the mark of a freshman feature filmmaker (a documentary veteran, however) who already enjoys a comfortable mastery of the medium. Nobody could have predicted that the next twenty-plus years would see Kore-eda become one of the leading voices of contemporary cinema, not to mention the Palme d'Or winner at the 2018 Cannes Film Festival, but any viewer not wowed at the time was simply not paying enough attention. Kore-eda has become best known for his intricate studies of family dynamics. 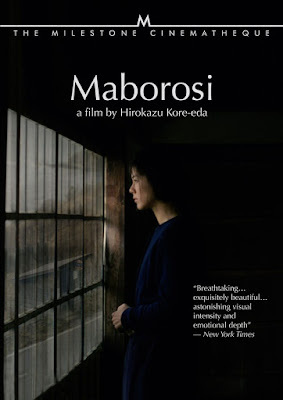 In “Maborosi” (which translates as illusion or mirage), he paints a serene and stately portrait of grief, a grief that rarely erupts in tears but which always lingers, a parasite lying dormant at times but always ready to consume its host. The grief follows Yumiko everywhere, even when she makes her own move from Osaka to a tiny fishing village (shot on location to great effect) on the shores of the Sea of Japan to be with her new husband Tamio (Takashi Naito). The grief does not abate even when friends and family shower her with love and support, only strengthening its power as it becomes increasingly co-mingled with guilt. Esumi, then a model making her film debut, delivers a confident performance, fully comfortable at her stillest, quietest moments, so often just marking time. Yumiko sometimes buries herself in work or in caring for her beloved son, but the past simply won't loosen its grip on her. That doesn't mean “Maborosi” offers Yumiko no hope, far from it, rather it acknowledges that we pick up certain unwelcome visitors in our lives, ones who stick around so long they eventually become defining aspects of our own identities, not even good or bad, but simply there. Kore-eda rarely relies on close-ups, the camera hanging back at a discreet distance to observe the characters respectfully and with a clear eye. Strategically repeated sounds like the bells of a bicycle or the roar of a train provide the emotional heft of a story with few overtly dramatic elements aside from the crucial losses, which occur off-screen. “Maborosi” was well-received on the festival circuit, but didn't play to a large audience. Kore-eda would experience a greater breakout with his next feature, “After Life” (1998), and secured international stardom with critical hits such as “Nobody Knows” (2004) and “Still Walking” (2008). “Maborosi” is as accomplished as any of them. The film is presented in its original 1.85:1 aspect ratio. The film has a generally soft, low-key look throughout, not much in the way of sharp contrasts. This high-def transfer preserves that feel, perhaps without the razor-sharp detail some high-def releases showcase, but the final product looks quite satisfying to me. The LPCM 2.0 audio mix is crisp and efficient with no evident signs of dropoff or distortion. The film features a lot of silence, but its spare sound effects are still important, as is the quiet, moody score by Chen Ming-Chang. This mix does justice to it all. Optional English subtitles support the Japanese audio. Milestone hasn't packed this with as many extras as some of their more comprehensive releases, but they've included a few strong supplements. The film is accompanied by a full-length commentary track by professor and film scholar Linda Ehrlich. I've only had the chance to sample the first half hour of the commentary, but it's packed with information and close textual reading so far. “Birthplace: Makiko Esumi” (30 min.) is a short documentary which follows the film's lead actress as she returns several years later to the village that served as the shooting location for much of the film. It's a little short on insight, but it's good to see some of the places and people again. Hirokazu Kore-eda's debut feature shows a filmmaker already performing at his peak. Amazingly, he's managed to remain there for about a quarter century, and he may only just be getting started. This Milestone release gives viewers a chance to check out where he got started.